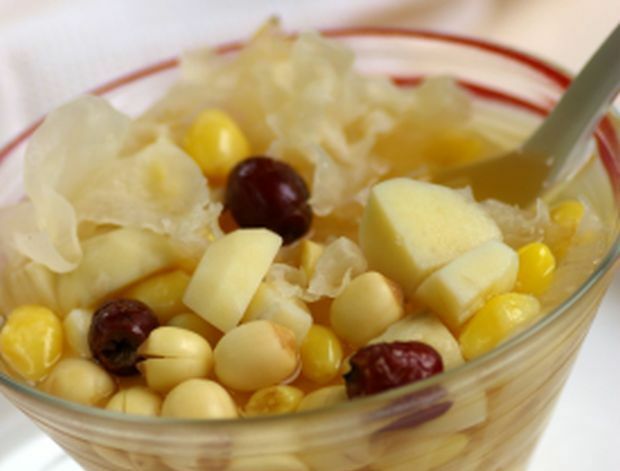 A delightful dessert, made from arrowroot bulbs and lotus seeds, that is commonly served during Chinese New Year. Peel arrowroot and cut into cubes. Soak the dried lotus seeds for 25-30 minutes. Remove the bitter green stem in the seed. Soak white fungus briefly until softened. Cut off the hard, yellowish stems. Bring water and pandan leaves to a boil. Add in all the ingredients except the rock sugar. Bring back to a boil then lower heat and simmer for about an hour. Very delicious, now very hungry.